When evaluating Teachworks and Teachworks competitors, you may want to pay special attention to the different time saving features each software has to offer. Spending less time on admin will give you more time to focus on other areas of your business. Teachworks offers a number of time-saving features that can help to reduce your workload and stress levels. One of these features are automatic invoice flags. If you invoice clients for individual lessons, and changes are made to lessons included on an invoice, the invoice is automatically flagged if the changes affect the invoice total. You can quickly account for changes by simply clicking the flag and following the prompts. 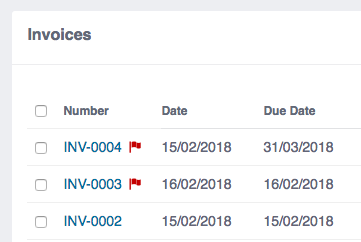 If a lesson that’s been added to an invoice is deleted or changed in the Teachworks calendar, a red flag will appear next to the invoice number in the invoices table. To view the changes, simply click on the flag to open the invoice. You will notice tags next to each lesson that’s been deleted or changed. You will also see a tag next to the invoice total that indicates the change in the invoice total and how to account for it. If the invoice total decreases and the invoice has already been marked as paid, you will be prompted to issue a credit note. To quickly navigate to the Create Credit Note form, click the link provided in the tag that appears next to the invoice total. A line will automatically be added to the credit note with the correct amount to streamline the process. If the invoice total increases, you will be prompted to generate a separate invoice to account for the additional cost. The link provided will open a New Invoice form with a line item automatically included for the required adjustment. If an invoice has not been paid yet, you’ll be prompted to update the invoice with the new lesson details and costs. You can click the link provided in the tag next to the invoice total to quickly open the Edit Invoice form – this will refresh the lessons included on the invoice. If the invoice was previously flagged, but the “Hide Flag” option was selected. In this case, the invoice will not be flagged if future changes are made to the lessons included on the invoice. 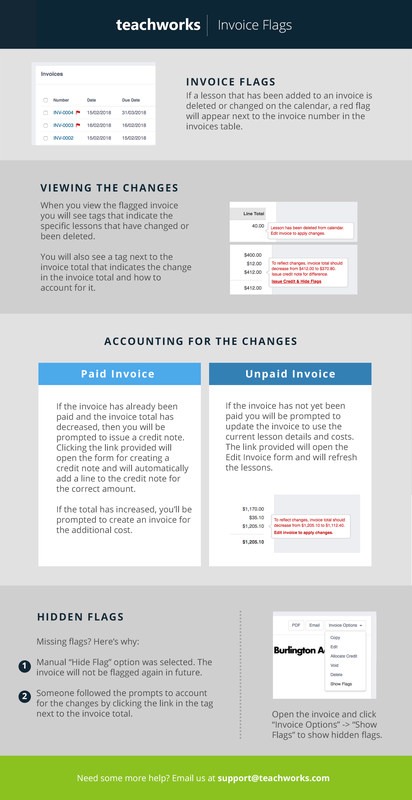 If someone opened a flagged invoice and followed the prompts to account for the changes (for example if a credit note was issued by clicking the “Issue Credit & Hide Flags” link). 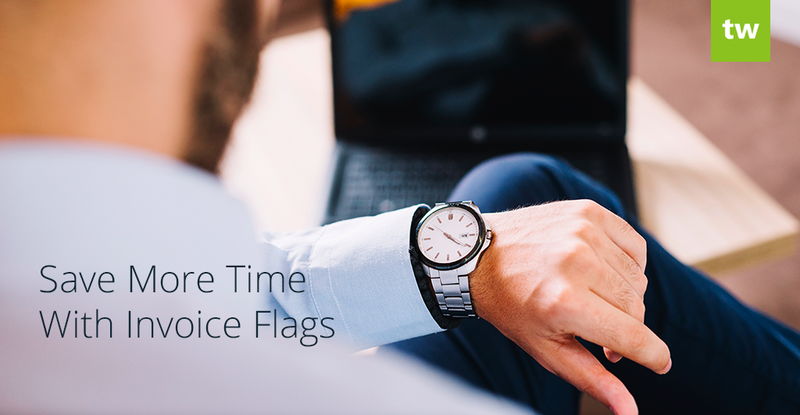 To show hidden flags again in these situations, open the invoice and click “Invoice Options” and select the option to “Show Flags”.